Jailed former deputy Finance Minister, Victor Selormey is reportedly very sick and on admission at the Korle–Bu Teaching Hospital, intelligence reports reaching The Chronicle indicate. Selormey, a resident of Nsawam Prisons serving an eight-year term for willfully causing financial loss to the state, was rushed to the Cardio Centre at Korle-Bu three weeks ago, this paper has gathered. Nsawam Prisons officials confirmed that he was admitted after doctors said he was in a bad state of health and the sickness was beyond casual treatment. But Korle-Bu authorities are tight-lipped about his whereabouts. Prof. Kwabena Frimpong-Boateng, the hospital's Chief Executive and head of the Cardio Department, has denied the presence of the ex-Deputy Minister at his outfit. However, some doctors The Chronicle spoke to, expressed surprise at the Professor's denial, and confirmed that Selormey was there. The doctors, who preferred not to be identified, said the man had been brought there for almost three weeks and was being attended to under tight security. “What was his (the Prof.'s) motive for denying the man's presence?” one doctor asked. Another said: “Well, he has the right to deny because Dr. Fiifi Ellis, the director of Trust Hospital was retired by the government when he visited Kwame Peprah, at Nsawam. A visit to Nsawam Prisons on Saturday to authenticate the assertion of the Korle-Bu chief executive proved this paper's fears as officials at the prison confirmed the story. Meanwhile checks at Korle-Bu last Friday revealed a security beef up at the ward where the former minister was reportedly on admission, with prison officers on guard. 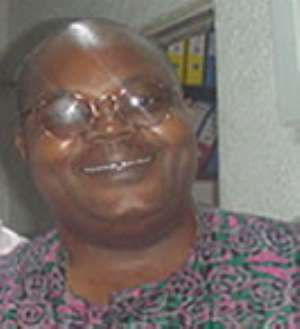 Prof. Frimpong-Boateng alluded to reasons why he was unable to confirm or deny whether Selormey was on admission or not. “Even if he is here, I have to seek his consent before giving any information out because he can sue me for that. I cannot give any information on that because this is a serious issue. If anything, it would be the Minister of the Interior who can talk to you but I don't think he would. Well, what I can say is that he has not been brought here,” he said conclusively.